Two things went wrong, firstly it was mis-sold as a relatively short flat day and secondly the weather continues to be bad. Shame because it's Christine's last day and she was not happy as we struggled to find the hotel at 5.45 in the pouring rain. 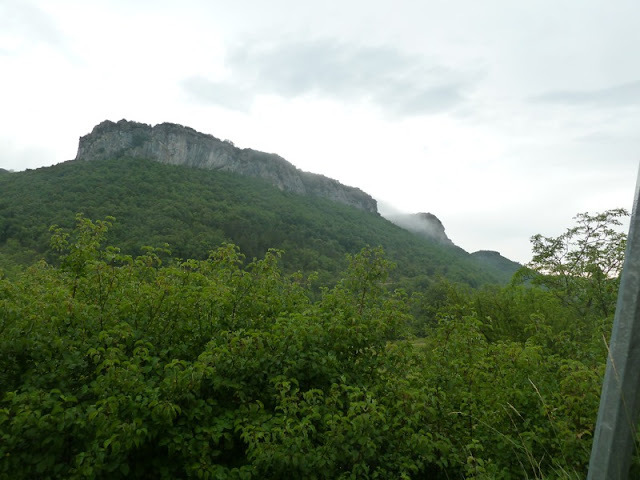 For some reason my schedule was about 10 kilometres out, I thought this was a 20k rather than a 30k walk and although we are no longer in the Cevennes we still managed to find over 600 metres of climb. Went into the town centre in Les Vans to get breakfast and food for the day. It was Saturday, market day and everything was there to buy. 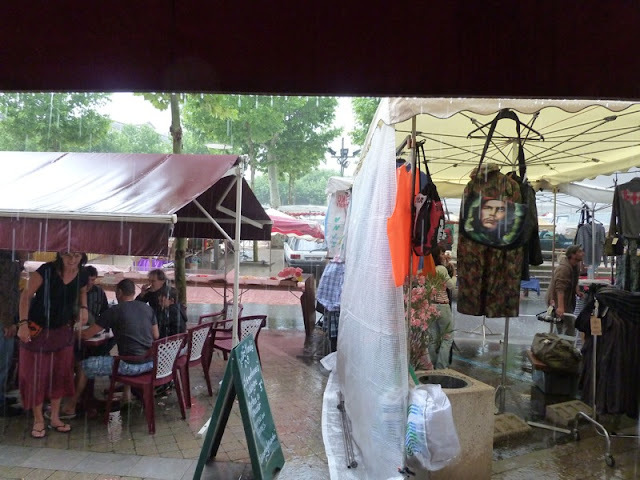 It was also dark and sombre and after ten minutes we got our first thunder storm which we were able to watch from the comfort of a cafe. We weren't going to get such comfort later. Pressing on we were soon out of town and dashing into a farm building to escape storm number 2 and watch a dramatic lightening show. The rain then eased off and apart from the odd bit of drizzle it looked like we had had the worse. In fact it started to get hot and humid. 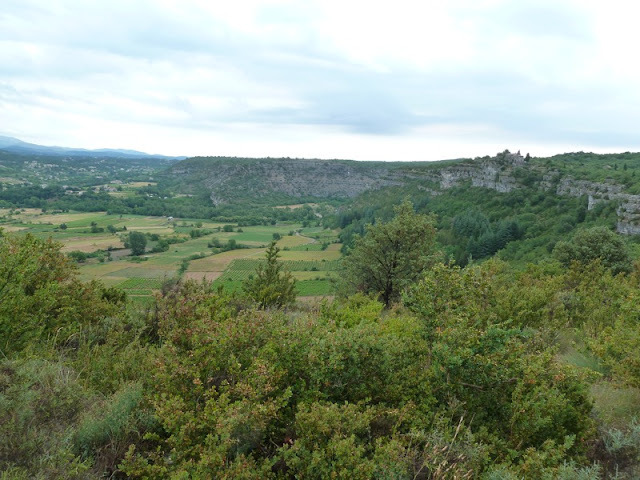 After walking across causse-like countryside and through a wood, and through growing numbers of French walkers, we got our first sight of the Gorge d'Ardeche, and walked along it's edge for about a kilometre. The view was great but the smooth wet limestone slabs we were walking along on the very edge of the cliff were treacherous. Stopped for a coffee in the village of Berrias under the illusion that we were half way and then crossed a flat arable stretch of countryside, a sudden change in the landscape. At about two we were climbing the hills on the other side and I was telling Christine we had about 7 kilometres to go. 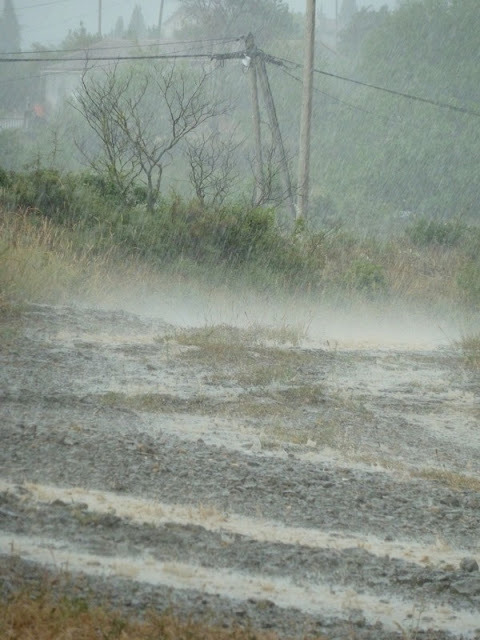 At 3pm the lightening started and the deluge began. Although we had a bit of a climb the trail was a good one and we were walking very fast and couldn't really understand why we weren't getting there. We seemed to be going round in circles along an endless high winding trail. It wasn't until nearly 5 that we saw a sign that gave us 4 kilometres to go. 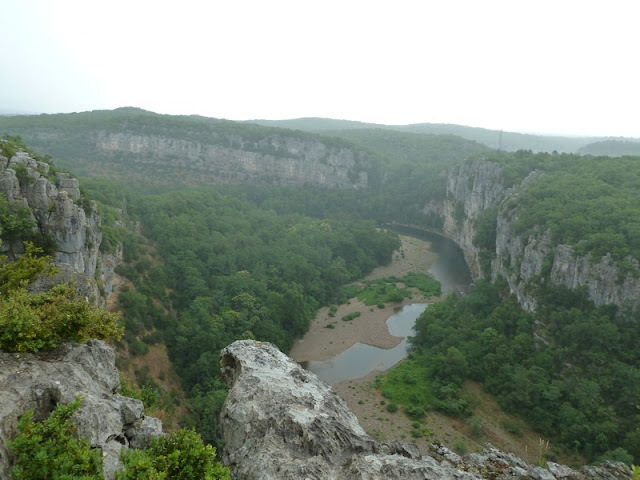 The views by the way on that last bit, despite the weather, were great with the River Ardeche winding away below us. Not in the mood to enjoy them and struggling to find the hotel amongst thousands of sodden campers was not exactly a pleasure. Looking at your original schedule you seem to be a day ahead? In a day or so you cross the famous Pont d'Arc. I canoed down the Ardeche for 32k some years ago with my brother in law, in a blazing August sun. Got sunstroke. Sue and I did the Seven Sisters yesterday from Seaford to Eastbourne to get some practice in. Fabulous weather but I got a blister on the ball of my foot because I was was wearing walking shoes. So I may revert to Plan A and use boots. John, still following your great adventure. Best wishes to Christine. Keep walking dear friend, your finishing point its near and enjoy the trip even if its raining for there will be better days to come. Bad luck with the weather. We certainly would not have wanted to walk along the limestone pavements above the Ardeche in rain. They must have been quite scary. You will be crossing the Rhone in a couple of days so thought that we would tell you about a possible accomodation option between Chateauneuf-du-Rhone and Dieulefit. We couldn't find any options for this section so we phoned the monastery at Aiguebelle and asked if we could stay in their Retreat centre. The Frere Hotelier saod that they did not normally take walkers but he then agreed that we could stay. It was a very peaceful spot with excellent accomodation and we got the opportunity to look around and listen to the excellent singing. 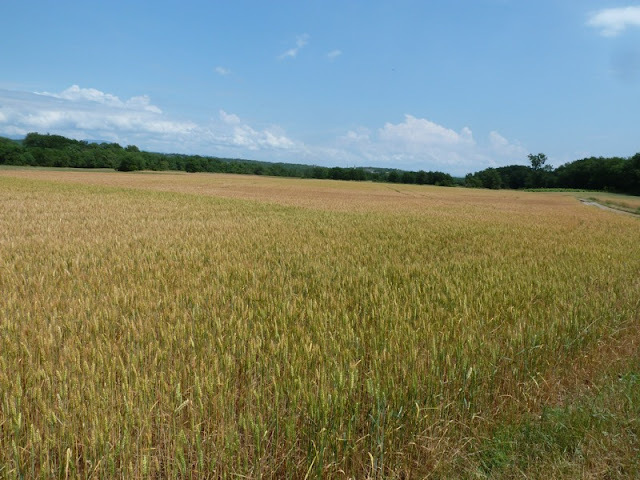 We werre very pleased to have had the oportunity to stay and it was certainly one of the highlights of the walk although as the Trappist order is a contemplative one we were expected to remain totally silent during our stay. This was not a hardship though. Unless I am wrong the gorges you encountered just after Les Vans are les gorges du Chassezac and not d'Ardeche. The Chassezac flows into the Ardeche somewhere near Salavas. And yeah, you really had bad luck with the weather. So had I. The heat was just unbearable.